BRYCE BLAIR was five years old when his family was ripped apart. But he was too young to understand what had happened to cause the tragedy. He grew up an orphan and charity case, but he always felt a great destiny waiting for him out on the horizon. As he investigates his past and discovers the hidden secrets about his parents, he learns that his deceased father was an African explorer. He decides to follow in his father’s footsteps by adventuring down the Nile in Egypt. Her Royal Highness, KATARINA MOROVSKY, is a princess without a kingdom. Her father was king of the small European country of Parthenia, and with his death, her despicable cousin seized the crown for himself. Katarina was stripped of her heritage and title. Worried for her safety, she’s fled her home country and travelled to Egypt. But life on the run is perilous and full of hazards. When she finds herself in need of a brave, trustworthy bodyguard, Bryce Blair seems the best choice. 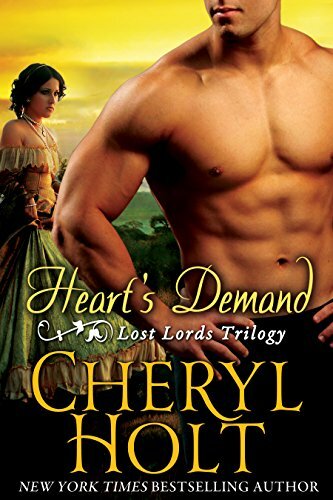 Bryce is fascinated by beautiful, mysterious Katarina and can’t help but agree to her request for protection, but it’s not easy to guard a royal princess. Nor is it easy to love her. With a throne at stake and fortunes in the balance, she will be a difficult prize to claim. But Bryce Blair—the Lost Lord of Radcliffe—has learned to fight and win any battle he wages. Katarina—known as Kat to her friends and family—kept her expression carefully blank. She hadn’t meant to stumble over the surname of Webster, and her hesitation made her sound like an idiot. Webster was her mother’s American maiden name. Since Kat was traveling in disguise and not eager to be recognized, it seemed the best choice. In reality she was Her Royal Highness, Katarina Victoria Sasha Morovsky, Princess of Parthenia. In ordinary circumstances, she would have proclaimed herself and used her title to obtain whatever boon or aid she sought. But her treacherous cousin, Kristof, egged on by his advisors, had revoked her status and designation. At that moment, she was no one of consequence at all. She was staggering about, trying to figure out how to proceed in a normal fashion when the entire foundation of her life had been destroyed. Kat glared, her green eyes shooting daggers. If she’d been a male, she’d have pounded him into the ground. If she’d been lumping along in her usual condition, she’d have snapped her fingers and had him dragged off to the dungeons. Well, not to the dungeons. She’d never behaved that way, but it was satisfying to imagine herself having some authority. At the very least, she might have demanded he apologize. She took a deep breath to calm herself. She was now living as all common people lived. She was being treated as all ordinary women were treated, and she had to remember and accept that fact. The ornate doors of the grand villa were shut in her face, and her temper flared. She wasn’t invited into the shady foyer. She wasn’t offered a chair in the garden or a sip of lemon water to cool her parched throat. A dog wouldn’t have been so shabbily abused, and she’d just raised a fist to knock and give the rude oaf a piece of her mind when he yanked the door open. The door was already closing, and she was so furious she nearly wedged herself into the threshold so she could force him to display some manners. Yes, she was in Egypt, and yes, habits and routines were very different in the hot, dreary land, but she was positive no servant in any country—even in Egypt—was allowed to be so insolent. She whipped away and stomped off, refusing to embarrass herself by begging for an audience. Apparently Monsieur Valois had resided in Cairo for ages and was the most savvy European in the city. If he couldn’t be bothered to confer with a damsel in distress, surely there was another man in the teeming metropolis who would be happy to assume the role. She yearned to shout her true name, but she kept silent. Not because her cousin, Kristof, had ordered her to stop using her title. Not because she’d become a political pawn in his mad scheme, but because she didn’t want it known that she was in Egypt. Kristof was insane, and she’d had enough of his devious machinations. He’d declared her deceased parents’ lengthy marriage null and void. Then he’d ruled Kat and her two younger siblings—Nicholas and Isabelle—to be illegitimate bastards. But his most grievous sin had been committed against Nicholas. Nicholas was her father’s son and rightful heir to the throne, but he was only twelve. When Kat’s father had died a year earlier, there had been a few months of uncertainty as a regency was discussed for Nicholas. Who should help him to rule? Who should supervise him until he reached his majority? Kat’s mother had perished birthing Isabelle, so for the prior decade, Kat had reared her siblings. She’d avoided her own marriage to stay in Parthenia and care for them. At age twenty-five, she seemed more like their mother than their older sister. She’d expected to be picked as Regent, but councilors had vigorously derided the notion. As the debate had swirled, Kristof had seized power and crowned himself king. He’d installed his supporters in positions of authority and disinherited Kat and her siblings. Kat was simply a female, from a very small, very peaceful country. She didn’t have an army. The kingdom itself didn’t have an army. She didn’t have legions of soldiers to impose a just ending for Nicholas. There had been no hue and cry from the citizenry to demand Kristof step down. In fact, he’d been roundly hailed for taking action, so she’d been forced to accept what had occurred. It had infuriated her, but she’d accepted it. They might have remained in Parthenia, but a friend of her father’s had pulled her aside and whispered that Nicholas might be at risk from Kristof. Initially she’d refused to believe it, but gradually she’d decided she couldn’t discount the words of warning. So long as Nicholas was alive and underfoot at the palace, he was a daily reminder to everyone that he was the lawful king, that Kristof was a deceitful usurper. It wasn’t the Middle Ages so the chance of a royal murder was very likely preposterous to consider, but Kristof was a fiend, and she would put nothing past him. It would be simple for a twelve-year-old boy to be poisoned or suffer an accident. Who could ever prove that treachery had been involved? Especially with Kristof’s loyalists handling any investigation. 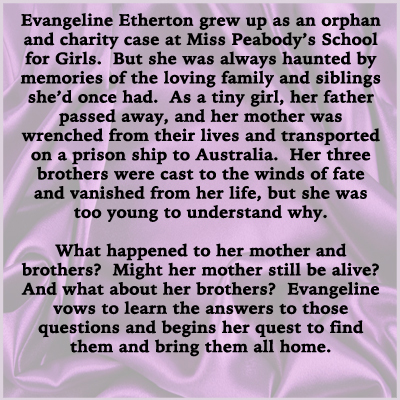 Kat would do anything to protect her siblings, and once she’d admitted that perfidy could transpire, there had been no reason to stay in Parthenia. She still had her own fortune from her mother’s dowry, so she’d had the funds to sneak away with Nicholas and Isabelle. Her mother had been a fetching, elegant American heiress. On her grand tour of Europe when she was eighteen, Kat’s father had met her and made her his bride. Kat’s father had been handsome and dynamic, and she imagined her mother had been swept off her feet by his regal proposal. But Kat had been fifteen when her mother had passed away in childbed, so they’d never had an adult conversation about her parents’ marriage. It was entirely possible that her mother had been unhappy as a queen in a foreign land. She’d been pragmatic and level-headed, possessed of very American ideas about equality and egalitarianism. She’d scoffed over the concept of one person being better than another merely because of the blood in his veins, and she’d frequently waxed nostalgic about the life in America she’d abandoned. Her only brother, Cedric Webster, was an archeologist who’d been digging in Egypt for decades. With Kat’s world in shambles, she’d decided to seek him out. He was the sole Webster relative who’d ever visited Parthenia, and he and her mother had been close. He’d help Kat, wouldn’t he? She needed advice from someone she could trust. She needed to rest and regroup under her uncle’s watchful eye. She needed consoling from someone who would tell her she wasn’t crazed to worry about Nicholas’s safety. Most of all, she needed his opinion as to where she should go with Nicholas. London? Paris? Rome? Boston? Was it necessary to put an ocean between him and Kristof? If that’s what it would take for Nicholas to be out of danger, then that is what she would do. Monsieur Valois’s spectacular villa was nestled on the banks of the Nile, the long driveway leading to a busy city street. She’d rented a chair, and four natives had carried her to her destination. They had remained outside the gates and would convey her back to the hotel where Nicholas, Isabelle, and Kat’s friend, Pippa Clementi, were waiting for her to return. She’d brought a parasol to shield herself from the sun, but she’d left it in her rented chair so the sun’s rays beat down unmercifully. She hadn’t walked twenty steps when the temperature began to be oppressive, and it occurred to her that she had to alter her wardrobe into one that was more suitable for the tropical climate. She was wearing layers of petticoats, woolen stockings, a jacket, a tight corset, and the air was so heavy and so still that she felt as if she was suffocating. The villa’s grounds were quiet, verdant, comprised of lush gardens of green foliage and fruit trees she couldn’t identify. She slipped under an arbor, pausing to fan her heated face, when she heard hearty masculine laughter, swords clanging, vocal jesting, and affable insults being hurled. She crept farther into the foliage, pushing a palm frond away so she was staring out at a smooth patch of lawn. There were two men fencing, several others lounging in the shade and observing the combatants. They spoke English with a British accent, and they were a bit older than she was, probably thirty or so. They were much the same size, six feet in height, with broad shoulders, muscled arms, and long, lean legs. One was dark-haired and one was blond, but they were both handsome as the devil. They were in trousers and boots, their shirts off, their chests bared, and it was inordinately thrilling to see all that male flesh. Their torsos had been bronzed by the sun, providing stark evidence that they spent an extensive amount of time strutting about unclad. She tried to imagine what it would be like to be so promiscuous with one’s person. In Parthenia, where the terrain was mountainous, cold, and snowy, people were always buttoned up from chin to toe, usually bundled in sweaters and coats. She was attired in garments she’d brought from home, and she wished she could be so free and easy with her clothes. She wished she could strip to her petticoat and find some comfort. The blond man in particular held her attention. He was arresting as a Greek god, his dynamic qualities almost tangible. They wafted toward her, and she was rooted to her spot and couldn’t move. His golden locks hadn’t been trimmed, and they were loose and curling over his shoulders. He had an aristocratic countenance, his face clean-shaven and pleasing to view, with sharp cheekbones, a strong jaw, a wide, generous mouth that was creased with laugh lines as if he was humored by life and smiled often. But it was his eyes that most intrigued her. They were a deep blue color like the waters in the Mediterranean Sea she’d crossed in her flight out of Italy. She’d never seen such eyes, and she wished she had the temerity to bluster over and gaze into them from a few feet away. No doubt it would be an exhilarating experience. Their swords crashed together, steel banging on steel, as the blond man worked the dark-haired man backward over the grass. He kept up the onslaught, hitting and hitting the other combatant until finally, with a hard flick of his wrist, his opponent’s weapon flew away. The onlookers cheered and clapped. A servant hustled over to Mr. Blair and held out a bucket of water. The virile fellow grabbed it and dumped the contents over his head so he was wet and slippery, and the sight did something funny to her innards. Her pulse raced. Her fingers tingled. In her sheltered, coddled existence as a princess, she’d had limited contact with men. 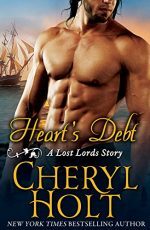 She couldn’t recall ever seeing a man’s bare chest before, and witnessing it was exciting but disturbing. His shirt was lying in the grass, and he picked it up, using it as a towel to dry his face and shoulders. As he tugged it on, a spectator stood and ambled over. He was older, probably fifty-five or sixty, but he was slender and spry with graying hair pulled into a tidy ponytail. He sported a thin mustache, and he was very elegant, his hands expressive as if he might be an artist or musician. Kat bit down a cluck of offense. So this was the notorious Monsieur Valois. He couldn’t be bothered to meet with her because he’d been playing games. He retrieved a sword and demonstrated several lunges. He was graceful as a ballet dancer, very quick and assured. Mr. Blair flashed a glower so crammed with imperious authority that Kat was stunned by it. Who was he? What was he? Why would such a magnificent male specimen be dawdling in Valois’s garden, engaged in a paltry fencing lesson? He was already stupendous. Why would he feel himself in need of training? “I could help you find it,” Chase Hubbard complained. Mr. Blair turned then, and for just a second, he was staring right at her. She froze and held her breath, praying he wouldn’t notice her lurking in the foliage. She planned to visit Valois again and would hate to have to explain why she’d been prowling in his bushes and spying on him and his guests. For a few seconds, Mr. Blair observed her, as if checking to be certain she was really there and not an apparition. Then he grinned and motioned with his index finger, indicating she should step out onto the grassy lawn. He was such an imposing figure that it was difficult to ignore his summons, but she could be quite imposing herself. She was a princess after all. “See what?” Mr. Hubbard asked. Kat heard naught more than that. Terrified they might come after her, she increased her pace. Yet as she reached the gates, she stumbled to a halt and frowned. When she’d arrived, the boulevard had been busy with traffic, with donkeys and camels and carts and pedestrians. Now it was quiet, no vehicles or animals in sight. Her rented chair was down the block, leaned on a garden wall, the porters having fled. She peered about, wondering what had happened. Tentatively she walked toward the abandoned chair, when suddenly she was grabbed from behind. A burly, pungent man lifted her and swiftly carried her to a waiting carriage, and it took a moment for reality to settle in. Throughout her life as a princess, she’d been counseled that such an insulting misfortune could befall her, but she’d never heeded the warnings. She’d grown up in safe, tiny Parthenia where this sort of thing would never have been contemplated. The prior year had been a hideous grind of disasters. After all the indignities inflicted on her and her siblings, this ignominy was the last straw. She was more livid than she’d ever been. Her attacker shouted in Arabic, but she didn’t understand the language so she couldn’t guess what he’d said. But his remark caused several other brigands to appear. She kicked at his shins and screamed at the top of her lungs. He tried to cover her mouth with his filthy hand, but she bit him, her teeth latching on firmly enough to draw blood. He bellowed with outrage and loosened his grip sufficiently that she wiggled away and plunged to her knees. Before she could scamper off, she heard quick, angry strides approaching. More words were shouted in Arabic and fighting commenced around her. She was too frightened to look up so she threw her arms over her head and hunkered down, anxious for the horrid episode to conclude. Finally there was a loud thump on the cobbles, and she peeked over. Her assailant was unconscious in the gutter, and his accomplices had vanished like smoke. Mr. Blair, the man from Valois’s fencing lesson, had a sword at the criminal’s throat. He was magnificent, tough and deadly, like a Crusader knight from days of old. My hero! She’d never been happier to see another person. She pushed herself to a sitting position and assessed her condition. Her palms were dirty and scraped, her skirt torn. Her bonnet had been knocked off, her brunette hair tumbling down her back in a messy chestnut wave. Too disoriented to stand on her own, she continued to sit, to stare at Mr. Blair. She was embarrassed to be so weak. Six months earlier, she’d been relieved of her title of princess, and already she’d forgotten how to muster royal fortitude. “Is he dead?” she asked Mr. Blair. He took the scoundrel’s weapons for his own, then riffled through vest, trousers, and turban. He found a string of prayer beads but naught else, and he tossed them aside. “Do you know who he is?” he inquired as he straightened. As rapidly as the frantic thoughts careened in her mind, she shoved them away. She’d been very furtive in her departure from Parthenia. No one except her friend, Pippa, had been apprised of her plans. Not even Nicholas and Isabelle. Pippa had helped her make the arrangements to travel, and she would never have betrayed Kat. They’d been raised together, were close as sisters. Pippa hated Kristof even more than Kat, and she’d have cut out her tongue rather than tell him a single detail. So…Kat had to calm down. She wasn’t being followed. No one was spying. Her lazy, unreliable porters had sneaked off and left her on her own. A random miscreant had seen her and pounced. That’s all it was. Mr. Hubbard from the fencing lesson rushed up to Mr. Blair. A gaggle of servants trailed after him, including the rude oaf who’d guarded Valois’s door and had refused to let her inside. She glanced away, not inclined to have him suppose she cared enough to recognize him. “What happened?” Mr. Hubbard asked. Mr. Hubbard snapped his fingers, and the servants seized the bandit by the ankles and dragged him away, his head banging on the cobbles. Shortly the whole group vanished through the gates into Valois’s estate grounds. She was alone with Mr. Blair, still staring, still sitting on her bottom and too disordered to rise. “Are you injured?” he asked as he came over to her. But she didn’t move. He extended his hand, and she reached for it and clasped hold. She shouldn’t have allowed him to touch her—at least not according to her prior rank. It was forbidden for anyone to touch her exalted royal anatomy, but she wasn’t royal anymore, and she had to get over the snobbery that had been instilled in her at birth. Besides, though it was silly, she wanted him to be in charge so she didn’t have to be. She was near to weeping, as if the attack had been her own fault, which was ridiculous. She’d done nothing wrong and needn’t feel guilty or afraid. He was very strong, and it was easy for him to pull her up. In a thrice, she was on her feet, but she was off balance and she smacked into him, the entire front of her body suddenly pressed to his. For an instant, they were frozen in place, and she gazed up into his blue, blue eyes. The strangest sensation swept through her. It seemed as if they’d always been friends, and her heart leapt, as if they were lovers who’d been separated then reunited. She tried not to regret the small distance he’d imposed between their torsos, but there was a peculiar and thrilling wave of energy surging from him to her, as if their proximity had enlivened the surrounding air. The second he retreated, the atmosphere calmed. He was still holding her hand though, and he bowed over it. She provided her fake surname with no difficulty, but she didn’t provide her town of residence as he had. French was the official language of Parthenia, but with its central location, she was also fluent in Italian and Spanish. And of course her mother had been from Boston, so Kat had grown up speaking English in the queen’s apartments. But she wasn’t about to mention Parthenia. “I’m an American,” she claimed. “You were spying on me,” he said. He laughed, the merry sound of it washing over her like cool rain. As she’d suspected when she’d first seen him, he appeared to be contented and happy. Very likely, he laughed often and joyfully, and she wished some of his jollity would rub off on her. She felt abused and aggrieved and nothing was amusing or fun anymore. The street was busy again as if the inhabitants had been hiding until the spectacle ended. With the excitement concluded, pedestrians were rushing past. She and Mr. Blair dawdled in the middle of it, their hands still inappropriately clasped together. He seemed in no hurry to release her, and Kat wasn’t about to pull away either. He exuded strength and power and ability, and just then it was exactly the kind of support she needed. “Will you come into Valois’s villa?” he asked. She probably should have demurred, should have worried about his motives or intentions. As he’d mentioned, this was Egypt, and it was a renowned haven for slavers, criminals, confidence artists, pirates, and other low types. What if he was a kidnapper too? What if he had wicked designs on her person? The inane notion flitted by, and she ignored it. He was courteous, faithful, and trustworthy. She stared into his mesmerizing blue eyes and was absolutely certain of it. He turned to a servant who was walking by and barked out a few orders in Arabic. Several men hastened to pick up her chair. They carried it over, and Mr. Blair helped her in. He rattled off another string of commands, and her new set of porters raced away at a trot. They departed very rapidly and, suddenly panicked, she glanced around, afraid they’d left him behind. But he was jogging along at their swift pace.